You can walk all through the garden on pink limestone paths. Throughout our county here in South Dakota we have pink limestone. Hot Spring’s historical victorian buildings were built out of a pinkish sandstone. You can take a peak at our named “2009 Distinctive Destination” by the National Trust for Historic Preservation. When we bought our house 18 years ago, I did not have a set plan for how my garden would look. I just knew I wanted a “secret garden” filled with flowers, fragrance and pink limestone paths. So, Ted and I set out to find and “mine” our pink pathways. We found places were we could dig up some flagstones. This was a job of hard work and patience. I don’t mind the hard work, but patience, I have to work on. Ted excels in both being fearless in the face of hard work, and he is patient. After finding our site, we had to carefully remove all the loose stone and any weight that sits on top of the potential flagstones. The stones are laid down in layers. When we found a good layer we used a sharp crow bar or shovel edge and slowly, carefully pried and lifted the top layer. The goal was to get as large a flagstone as possible before it would break. Then we lifted the stone onto the pickup. Our largest flagstone is 3 feet by 7 feet and about 2” thick. While Ted and I were pondering how we would ever get such a large, heavy stone onto the pickup, friends came by and helped us load the stone. I, the inpatient one had been ready to break it to fit. It took 6 men to unload the stone and place it in the carefully leveled spot where it has remained for years. If you go through my past posts you will see many examples of our pathways. 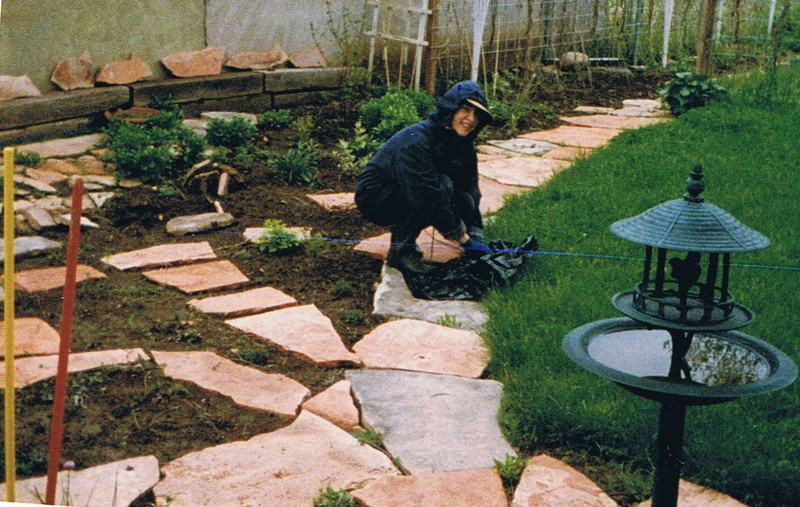 As I removed more and more lawn and planted gardens, Ted added arbors and structures. When I would say, "Ted, you know what we need?" he would say "One more load!" and so off we would go. What a workout! I worked with passion and determination to lay the pathways. Notice the rocks that line the back wall. I fancied they looked like fish. That is a totally lovely pathway, Gloria. And I want it in my own yard, which is unlikely to happen. You put in a lot of work, with a beautiful result, much nicer than those boring 'paving stones' flogged by some companies. Love your pink flagstone walks. Your pink limestone pathways are worth all the effort you put into them. Your garden is gorgeous. I wish I could find a source of free flagstones near me! Last year I purchased some large stones to use as a small patio under my arbor in the lady garden. One was about the size of your 7 foot one. The loaders were super careful until the very end. As they were setting it into place one of the guys dropped his end, and it broke in half! I was sad, but not too much. The two large pieces look just fine. I love seeing early photos of gardens. I have designed with and lifted flagstone....and it is heavy! 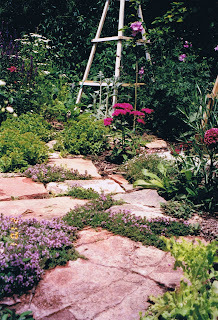 I greatly admire you and your husband for getting the flagstone yourselves :^) I have been enjoying your beautiful garden photos, because I enjoy the same style of garden. I can't wait to see what spring brings to your garden! Hi Noelle, thank you for your kind comments. 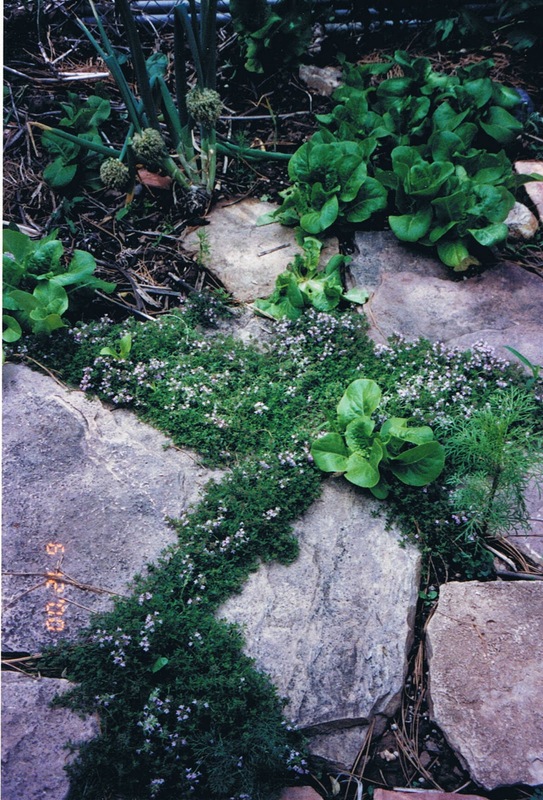 I have been doing a series on the "making of the garden" - Soon, before spring, I hope to do a "floor plan" of the garden and show a couple pictures of "before" we did a thing in the garden pictures. Those pictures are dry and weedy. I love the feeling of these Gloria ... the pink is so beautiful with your garden blooms! An elegant path!! Gloria, I am so impressed that you and Ted dug up and mined your flagstones yourself. And the results are beautiful -- well worth all the effort. Wow .. be proud of yourself. That's a beautiful pathway. I would love to walk along it enjoying the beautiful blooms. Dear Gloria, What I so love about the way in which you describe and illustrate your garden is how very personal it is to you and your husband. You clearly both take great joy and pride in it which, surely, at the end of the day is what it is all about. The natural pink stone is most unusual - I have never seen it quite that colour in the UK - and you are fortunate to have it so readily available. I always look forward to your postings. Dear Edith, Thank you for your kind comments. Yes, the garden is something Ted and I enjoy. I say to him: "The scent of the garden in the morning feels like vacation". Dear Blossom, you would be welcome anytime! Gloria what a beautiful colour of stone you have there - we've nothing like that in the UK - it looks so pretty now with all those little creepers in the cracks - before and after pics are great. 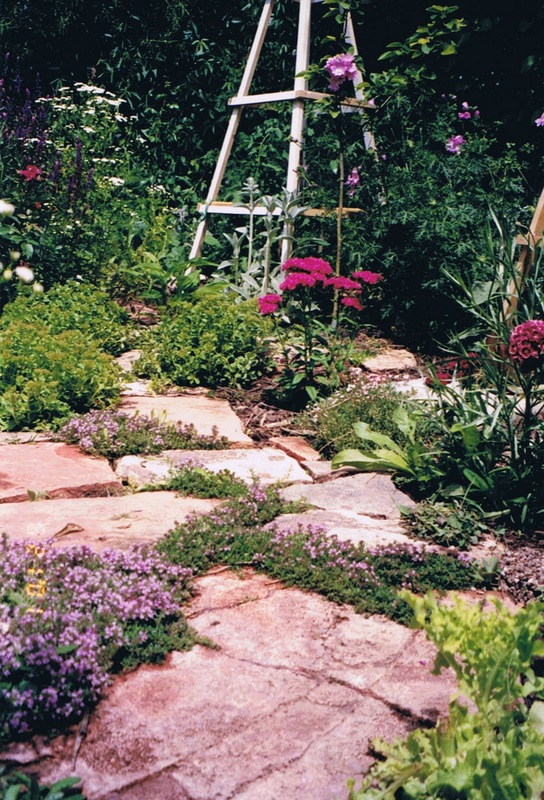 I just love these pathways and the story behind collecting the flagstones is precious! We do have other things here that are wonderful, just not native rocks. We have to purchase them. If I went to central Texas, we harvest rocks there! They get pushed up out of the ground every winter, and every spring, we are stacking a new rock fence before we can plant oats. I love your garden, as it is the same style that I always want. Very cottage garden like...I have to leave more grass in our garden because we have the dog- we will always have a dog, I am sure, and it just doesn't seem like it is fair or worth it to plant flowers and expect she will not walk, run, lay on them! Gloria, it's a thing of beauty! Working with stone in this careful and precise way does, indeed, establish a very personal relationship with the stones. I wish we could have used natural stone for the walkways in our garden, but that was not possible. But, the next best thing was using rocks to build the raised beds - which required a similar exercise in patience and perseverence. In your lovely walkways, the thyme growing between the stones completes the natural effect. Awesome!! Gloria, how fantastic! This is what I want for my front yard garden...planted the "privacy beds" and waiting for them to mature a bit (and saving my money!) before I clear the grass and lay similar stone. The color of your limestone is amazing! I love it! And your "fish" stones are great too! Nice work!!!!! I love your pathway. When you end up with such a great result all that hard work is worth it! Gloria, I must applaud your passion and abilities in creating those limestone paths. I know from experience the effort involved in building something like that and have had many an aching back as a result of it. I think it's grate how ye collected all the stone your selves (its hard work, but makes it so much more rewarding) When possible I also collect the stone myself for certain projects, especially if im building one of my stone benches (http://www.stoneart.ie/site41/index.php/portfolio-stonework/33-seats). However I go to a qurrie for this. Its time consuming, but I enjoy it every time im up there. PS. had a look at the hot springs link, will have to visit if I ever make it over that way to see the crazy horse memorial. Where did you mine the flagstones? How about the beginning of this story? Do show and tell please? I have never seen pink limestone. It is beautiful! Gloria, Its wonderful you can find such beautiful stone just lying around for free. The resulting pathways are worth all the hard work it takes to get it. Your garden looks fabulous as well. You have such a beautiful garden. I loved the story of how it was built. You and Ted sound completely adorable. I'm in awe, Gloria. Gorgeous! What a fabulous oasis you've created. I bet you spend every second you can out there.